Ideas worth spreading are no doubt those which ask of us to ponder, to reflect and to think about the possibilities. Generating this mindset is indeed a fruitful experience, once which is charged further when you have the chance to share and collaborate with others. Gathering in one space, for a unifed focus and event ignites an energy that is just right for considering ideas shared and how one may act on them. Possiblilites unfold and connections are made, sometimes re-connections too, all with the potential of spreading and developing into what we choose to make of them. With this year’s more intimate and collaboratively inviting setting, I stepped into the space feeling not only energized but also positive about the day ahead. You see, the Royal Conservatory of Music in itself is an architectural marvel with a modern blend of bricks/mortar with glass, steel and other cool-toned finishes. The floor to ceiling windows in the foyer space outside of Koerner Hall (where attendees gathered, mingled and connected) let in so much light that allowed the natural beauty from outside Bloor Street to mesh with the beauty of ideas forming within the building – it was truly magical. In this space, we were free to roam around and interact with others across 3-levels, each which offered a different dynamic in terms of furniture orientation and layout. The main level was fantastic for bumping into just about anyone, but as you moved up to the second level (especially during the lunch time Panel Discussion), the vibe (and the view) changed which not only allowed attendees to readjust their perspective based on where chairs and couches sat, but also offered a different space of thinking, for a different set of ideas. Within Koerner Hall itself, I felt comfortable and at peace. Previously, during the 2012 Conference, there were many more people – the energy was great, but the sense of connection was spread among too many making it hard to truly feel connected with the person sitting beside you. The theatre space was a perfect size for a gathering of this type. As the theme “The Choices We Make” brought forth many authentic and meaningful stories from speakers, it was great to be able to have this sense of community to reflect with one another. Without a doubt, the variety of attendees at a TED event offer a rich breadth of experience and backgrounds. It is in connecting with these people that new ideas emerge out of the theme addressed, or totally otherwise. 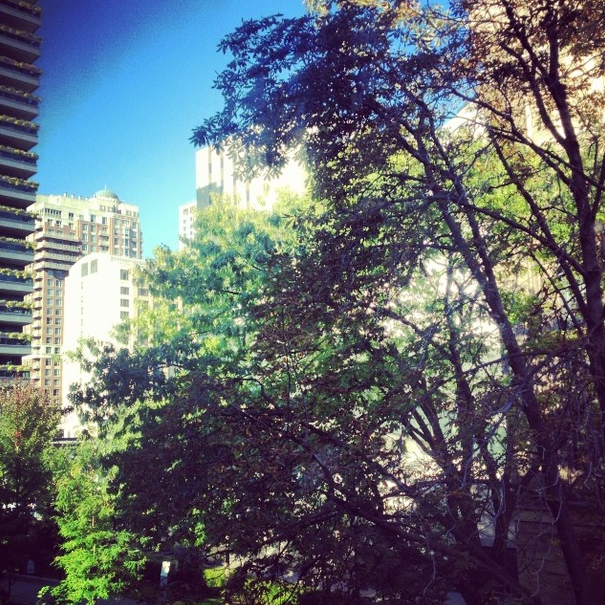 During my time at TEDxToronto this year, I was able to make meaningful connections with a few people that I took something from (whether that be something to consider, a new resource to explore, or a perspective from a different angle). But – what was more interesting, to me, were those connections I had already made that were unearthing that day. During my time at the conference, I spoke in-depth with one of my Grade 7 Teachers, I re-connected with a publishing contact I knew, ran into a friend from high school and had a promising conversation with a C-Level stakeholder of the institution in which I work. 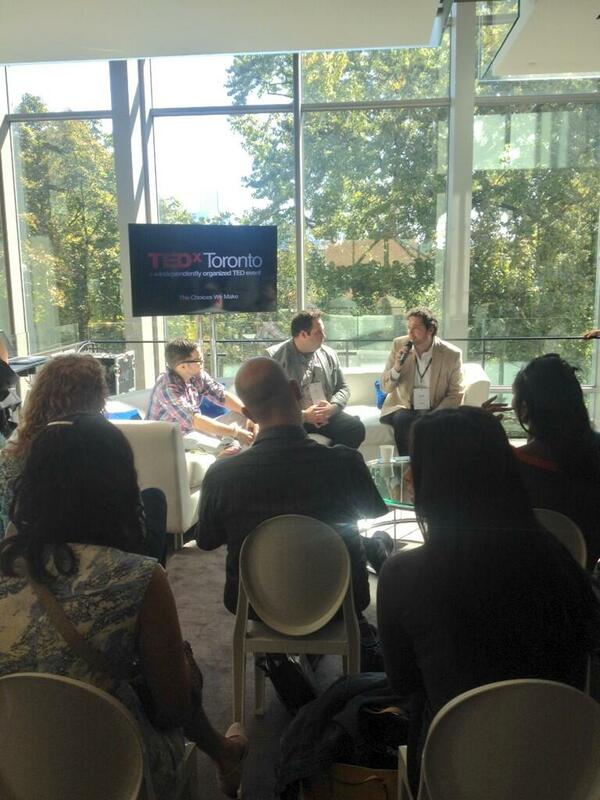 Not only was it great to see and speak with these people, but it was amazing to reflect on how I knew each one within a different context, for different reasons, and centrally connected with each at TEDxToronto. Whether we share a similar frame of mind, are explorative by nature, or just simply curious, it was interesting to see how those aspects of my life suddenly fit together. These connections, within the space, linked to form a strong community along many levels. 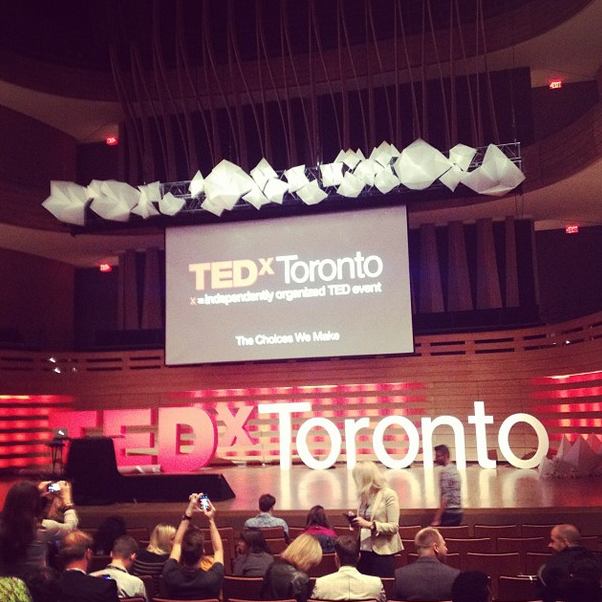 Together, in general, we all existed as TEDxToronto attendees, organizers, speakers and so on – but more specifically, we were forming sub-communitities and micro-communities from this larger hub. We connected on similar topics which may have stayed streamlined, or which may have diverged into something new and unexplored – but we were connected. 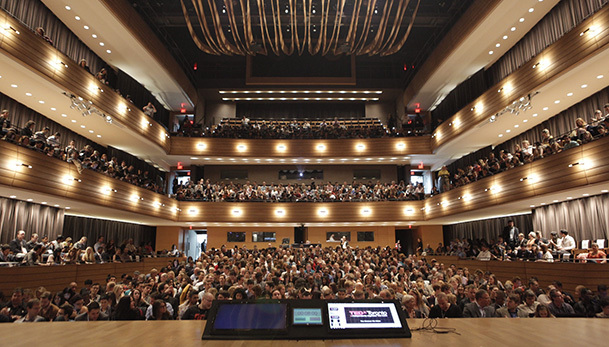 This connection spread from the physical realm and blended (as it had been doing for weeks prior to the conference) to online spaces such as Twitter, Instagram and the TEDxToronto App. Another level arose – we were able to take our initial connection as a community and continue it soon or long after we left for the day. Through Social Media, we could continue conversations, re-connect with those we met, share, and much more. To me, this was a part in archiving the event, a process in curation that will allow me to continue to look back (and forward) to consider and learn more. 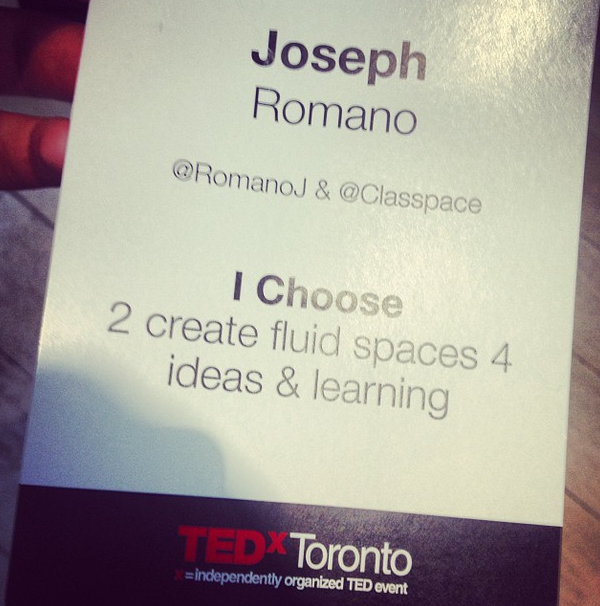 Before I attended TEDxToronto 2013, I knew to expect something great, but I didn’t know why. I thought that I would take something from it, but I didn’t know what. I believed I would make connections, but I didn’t know with whom. These thoughts, and many more, have been addressed as I left the space feeling fulfilled, energized and looked forward to how I would impart this on that which I take on next. At the end of the day, these were my ideas – those I thought worth spreading.